After the blues, probably the most played and most essential chord progression/song form in jazz is the famous “rhythm changes.” This chord progression, originally derived from George and Ira Gershwin’s classic “I Got Rhythm,” written in 1930, has been performed or recorded by countless jazz musicians. The simple elegance of the song’s architecture became a favorite vehicle for improvisation and inspired many musicians to build their own compositions with all new melodies around the borrowed chord structure. At the same time, and especially during the bebop era in the 1940s, harmonic variations were woven into the song’s basic form. Because of its historical significance and classification as a standard, any aspiring jazz musician will need to be familiar with rhythm changes and should work toward mastering its many variations. Rhythm changes is considered to be something of a proving ground for young up-and-coming players due to the harmonic complexity of many of the versions and the fast tempo at which the form is often played. A new generation of musicians has reinvigorated jazz with fresh and innovative sounds and approaches, but rhythm changes continues to be an essential part of the modern style. If you are interested in learning rhythm changes in a complete, logical, and thorough manner, incorporating modern elements while still maintaining a thread of the tradition when you play over the form, or gaining proficiency with playing this progression or others at up-tempos, then this class is for you. In this class, the rhythm changes form will be explored in detail with the goal of applying modern jazz melodic, harmonic, and rhythmic vocabulary to the progression. First will be a brief survey of the structure and history of the form along with exercises for gaining mastery over the basic harmonies. Then, common mainstream approaches for melodic and harmonic variations on the progression will be outlined. Finally, modern approaches to melody, harmony, and rhythm will be applied to the rhythm changes progression. If you want to learn to play Rhythm Changes and be thorough, you need to buy this class! This is a GREAT class! Tons of examples for comping and soloing. Tom explains everything very clearly and the whole lesson is very easy to follow. And much of the stuff is applicable to other tunes as well. Thank you Tom for these amazing masterclasses! Each one i’ve bought are just pure gold! So well organized. I have previously brought 5 of Tom’s lessons and I’ve found them to be immensely musically enriching. I’ve never been disappointed. A clear and thorough approach to the basics, plus great illustrations of the subs used on diatonic changes that really show where the ‘jazz sound’ comes from harmonically. I found the single-note exercises very helpful in applying all the information. Nice work Mr. Lippincott, and thank you! A really complete lesson on the rythm changes. With this class u ll study it from the beginning to the more complex forms and learn great substitution ideas really effective! Amazing lesson packed with information. I very much appreciate Tom’s approach of starting with the basics and using this as a foundation on which to build up to more advanced, modern approach. He has the right balance of explaining and examples (a sign of an excellent teacher). This lesson alone has really helped my playing, and what’s incredible is that there is a part II. You cannot go wrong with this class. Highly recommended. Excellent course on learning a vital set of changes for all Jazz musicians. Tom covers the basic Rhythm Changes both traditional and Jazz, but shows you how to keep evolving with many approaches to using chord substitutions. 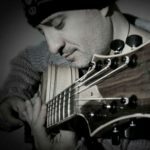 Tom does the same for improvisation covering fundamentals of arpeggios, guide tones, and classic lines to learn and study. The improv continues to study implying those chord substitutions as well as other scales. This alone is a very complete course on Rhythm Changes, but there is a part two that continues with more source for improv sounds. This class is an excellent way to learn Rhythm Changes getting the necessary foundation and resources for creating your own sound. Tom is a great player and teacher. There is a ton of information here. Great insights into various approaches to playing over these changes, and Tom provides lots of great line examples with the theoretical foundations for each. Highly recommended! I’m looking forward to checking out his other lessons. A great intro to the vast matrix possibilities that can be explored over Rhythm Changes. I like Tom’s explanations and he’s a great player who has certainly done a lot of research on this topic. I look forward to checking out some of his other videos. A very complete and interesting lesson. Tom’s explanations are so clear and enlightening. He is a truly gifted teacher and player. I look forward to seeing Tim’s other tutorials! Thanks a lot Tom! Tom is a very good teacher. That’s that. The way he progresses through material is fantastic. Progressing from comping to moving through both horizontal and vertical approaches to the progression while always building in complexity is more than worth the price. Are you going to get more confident and creative in negotiating your way around rhythm changes tunes? Absolutely! But, there is SO MUCH here that can be applied to so many other tunes. Enjoy the many hours of work ahead. You’ll be inspired. Nice job, Tom. Don’t go any further if you’d like to master playing over Rhythm Changes. Tom breaks down the chord progression to it’s essentials, provides exercises that are fun, exciting, and will definitely make you become a more complete player. He discusses many different (and, most importantly, good sounding) approaches for improvising. I definitely grew a lot in terms of my playing, even only after a few weeks of practicing with Tom’s method. This lesson is a must for everyone who wishes to look into Rhythm Changes seriously. I’d give 10 stars if I could! Part one covers ideas from traditional bebop in which Tom presents them in his usual organized and exciting ways. You will get choruses of ideas from this video. Part two is where things get even more exciting with modern ideas in harmony and rhythm. Great guitarist and teacher, just can’t go wrong with his lessons. Another winner! Tom’s classes are among the best value anywhere; longer and more in depth than most others; more complete written materials to study; plus, he takes subjects that you will not find elsewhere and makes them accessible. These 2 Rhythm Classes are filled with ideas from the earlier series of Tom’s, but you don’t HAVE to have bought them; these 2 stand on their own. I do recommend you invest in his others anyway, because then, you can see how "modern" ideas are not just useful in circumstances like "Inner Urge" or Zhivago", but translate to anything you play from the Beatles to Robert jr. Lockwood to Hector Berlioz. I bought these 2 the day they came out, but it has taken me this long to get through them, as there is so much to take in. I will be absorbing these marvelous classes for a long time to come. Another amazing guitar lesson ……fresh, clear and a bibbie of tricks…..